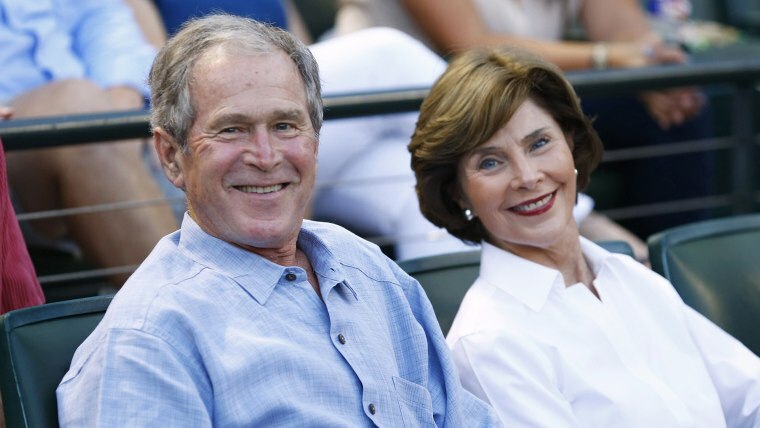 George W. and Laura Bush had two big reasons to celebrate over the weekend, and the former president summed up both of them in one short and very sweet post on Instagram. Alongside a photo of the two of them, he wrote, "Happy 40th anniversary and undisclosed birthday to the love of my life, @laurawbush." Yes, Saturday marked the former first lady's birthday, and since we're not her kindly cautious spouse, we can add that she turned 71 — just as her husband did a few months earlier. The very next day the duo celebrated their anniversary. And they're not just commemorating 40 years since they got married — it's barely been more than that since they first met! The Bushes' enduring partnership began with a whirlwind in 1977. They were introduced to each other in July, engaged in September and then swapped vows on November 5 of the same year. The Bushes have two daughters — including TODAY's very own Jenna Bush Hager — and two granddaughters.